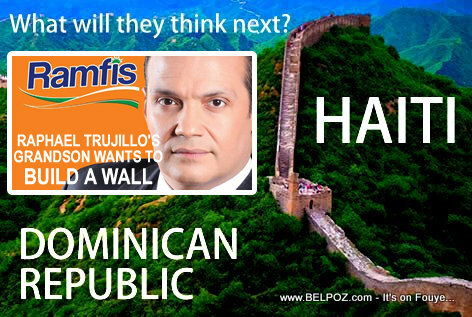 Obsessed, like his grandfather, by the presence of Haitians on the Dominican territory, Luis Ramfis Trujillo Dominguez never misses an opportunity to express his dislike for the Haitian nationals he accuses of wanting to invade his country. It's kind of funny that, while the Dominicans in Pedernales are crying because the border is closed they cannot make money with Haitians in Anse-a-Pitre who cross the boreder to buy from then everyday, this idiot wants to build a wall. I noticed the same racism in the big 3 (DR, PR and even Cuba, which I visited three years ago). jokes to me because I'm white, hence racist of course. Yes, let him build it. see who is going to lose more, Haiti or DR.? Poukisa nou pa bloke rapo komesyal dezekilibre nou gen ak dominikani an kote se yo sel ki prensipal benefisye a.
Fe komes ak lot peyi. Kreye inivesite lakay nou pou sispann voye jenn nou yo al fome lakay yo. Pote biye vet ba yo. Poukisa nou paka femen fwontye a?